KINETIC R1 NOW IN STORES! NEW Kinetic Control and Smart 2 bike trainers deliver incredible ride quality, reliability and dual-band connectivity to all the best training apps. Connect with a world of training possibilities with apps like Kinetic Fit, Zwift, TrainerRoad, Rouvy, Kinomap, The Sufferfest and FulGaz. You’ll train smarter, ride farther and enjoy it more than you've ever imagined. Is your device of choice a tablet, phone, Apple TV or computer? Whether you use an iOS or Android device or a Mac or Windows computer, you'll have a training solution for Kinetic bike trainers. Use an external monitor and integrate a home entertainment system to put yourself in the middle of the action. If your bike is equipped with a rear thru-axle, you'll need a Kinetic Traxle. Kinetic Smart and Smart Control trainers and inRide sensors work with cycling’s best power training apps. Whether it’s structured training and training plans, real video courses or an interactive 3D game environment, you can experience it all with a Kinetic trainer. Enter the virtual reality world of Watopia with video-game quality 3D graphics and interface. Race or train with Zwift riders worldwide on a variety of courses. Ride structured workouts in ERG mode or free ride on courses in SIM mode. Connect directly with Kinetic Smart Control trainers with the Zwift iOS app. Or connect to a Mac/Windows computer over a wi-fi network using the Zwift Mobile Link app. Athletes of all disciplines and fitness levels get individually tailored structured cycling workouts, science-backed training plans, and easy-to-use performance analysis tools to measure progress. Connect directly with Kinetic Smart Control trainers with the TrainerRoad iOS or Android apps or native Bluetooth® Smart-equipped Mac and Windows computers. Get unlimited streaming or offline access to a massive library of structured cycling, running, and triathlon workouts, 30 Yoga for Cyclists videos, and a 10-week Mental Toughness Program. Every workout combines killer soundtracks, engaging storylines, and exclusive footage of the world's biggest professional races. Connect directly with Kinetic Interactive and Fluid Smart power trainers. Available for iOS, macOS and Windows. Rouvy is a complete training solution that brings the excitement of augmented reality to your indoor rides. The open platform gives you access to 2,000 real-life video routes and 4,000 workouts. 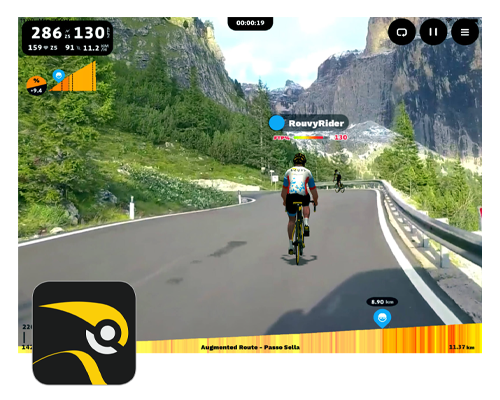 Augmented overlays of 3D riders turn any road into a realistic virtual bike race to enjoy for training and group rides. Rouvy connects directly with Smart Control trainers, Smart trainers and inRide sensors using iOS or Android apps or Bluetooth® Smart-equipped Windows computers. Kinomap gives you access to hundreds of fully geolocated videos for real-life ride simulation on outdoor courses. Connect your Smart Control trainer to the app, select a video and watch your bike icon moving on the map and on the elevation line. Your goal is to produce enough power to follow the rhythm of the original video as a ghost. Features individual and multiplayer modes. Connects directly with iOS or Android apps. 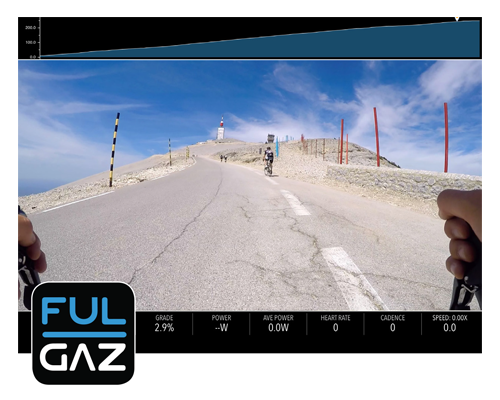 The FulGaz iOS app for iPads and iPhones takes indoor training to the next level, combining HD first-person video with advanced physics modeling for real-world ride simulations. It looks and feels like you're there. Connect directly to Smart Control and Smart trainers and inRide sensors with an iOS device. FulGaz offers 14-day unlimited free trials for new users. Click below and follow the directions to get started with your app trial now. Use the Kinetic Fit app to calibrate and update firmware on Kinetic Interactive and Smart Fluid Power trainers. The Fit app is also the easiest way to get started power training right out of the box. Personalized workouts and training plans, data sharing to 3rd-party apps, second-screen viewing to TVs, video streaming. A free 6-month trial subscription is included with all Smart Control trainers and a free 1-month trial comes with Smart Trainers and inRide sensors. iOS and Android apps. Kinetic has the tools to help you improve. Whether you’re a beginner or a seasoned cyclist, We will help you go farther and faster on your bike. Discover a range of structured training resources, workouts and training tips and connect it all to your healthy lifestyle with apps like Kinetic Fit, Zwift, TrainerRoad, Rouvy (formerly VirtualTraining), Kinomap, The Sufferfest and FulGaz. The road map to success follows our 4- to 8-week training plans designed for Kinetic by coach Drew Edsall. Use the Kinetic Fit power-training app for guided workouts.